The very northern part of the Croatian coast, the Istrian peninsula, is one of the most heavily touristed parts of the country – quite an achievement, given how solid much of the rest of the coast is! 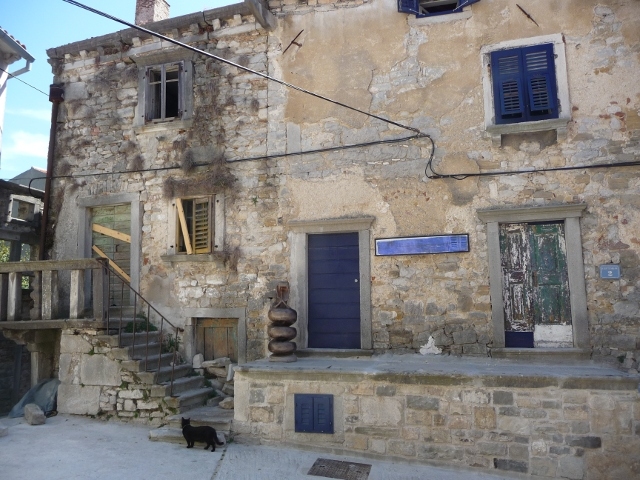 However, as we got off the boat from Cres and headed towards the hill town of Labin, there was almost no sign of it. 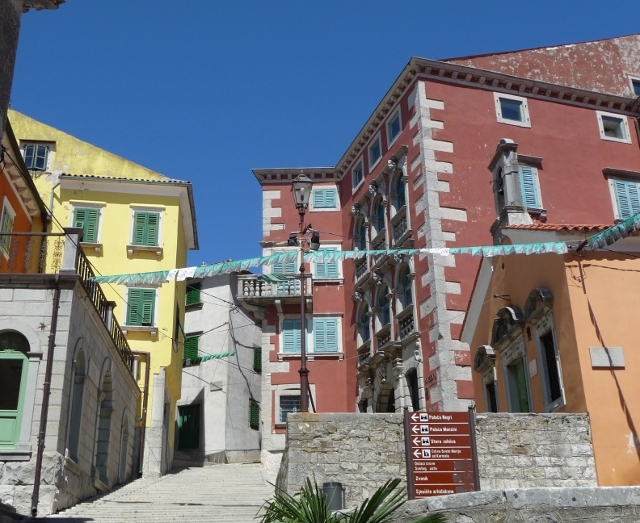 Labin’s an old mining town, and the historic centre was abandoned in the 1980s due to subsidence. Rather than let it collapse and rot, though, the authorities restored it, and let many of the properties out at cheap rents to artists. As a result, it’s seen a rebirth, and much of the beautiful old centre is galleries and studios. Given that, you’d expect that it would be heaving with tourists – but, no. We wandered around almost deserted streets, stopping to peer over the old city walls down at the coastal resort of Rabac below, then over the water back towards Cres. As we headed on towards Pula, it became obvious that the key to Istria’s tourism is “coastal resort”… South of the city lies the tip of the peninsula – and it’s solid with hotels and campsites… We eventually found one that wasn’t heavingly full and/or hideously overpriced, and I had a quick wander down to the beach to see what was the big attraction. I returned not much the wiser. 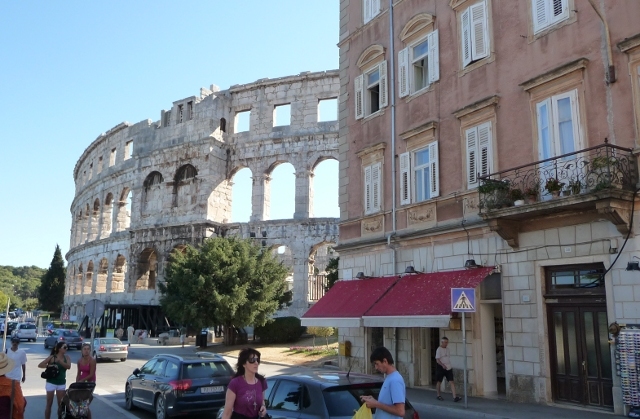 The draw of Pula itself is much more clear-cut – the amphitheatre. Reputedly the sixth-biggest in the Roman world, the outer shell is remarkably complete, although the inside is less so, with only a few small sections of the seating still in place. Underneath the main arena, the original tunnels which would have housed the gladiators, lions and two-legged lion-food awaiting their turn are still in place, but now full of an exhibition on the Roman olive and wine industry in the area, together with the amphorae they were shipped in. All interesting, but – all-in-all – some of the other amphitheatres we’ve seen have been much more compelling and atmospheric. The old centre of Pula’s only a short wander away, with various other Roman ruins around the Venetian core – all dwarfed by a huge ship being worked on in the shipyard seemingly metres behind the main square and Roman temple of Augustus… A life-size bronze of James Joyce (who taught English here for a few months – and hated the place) sits at a table outside a café, right next to a triumphal Roman arch. Away from Pula, we headed through tiny back lanes, trying to cling to the coast – we sort of managed, although for most of the way it wasn’t visible – the lanes were lovely, though, even when they took us miles out of our way before stopping dead. Eventually, though, we found our way to Bale. The inland portion of Istria is a total contrast to the coast – unspoiled, attractive, and in a gentle time-warp. Street after street took us past wonderful old stone houses and barns, many in various stages of decreptitude, with some tastefully restored. The village elderly sat around, passing the time of day with anything that moved. The only sign of real activity was a stage set up in the main square, just around the corner from a small bar/restaurant, ready for the start of their annual jazz festival. 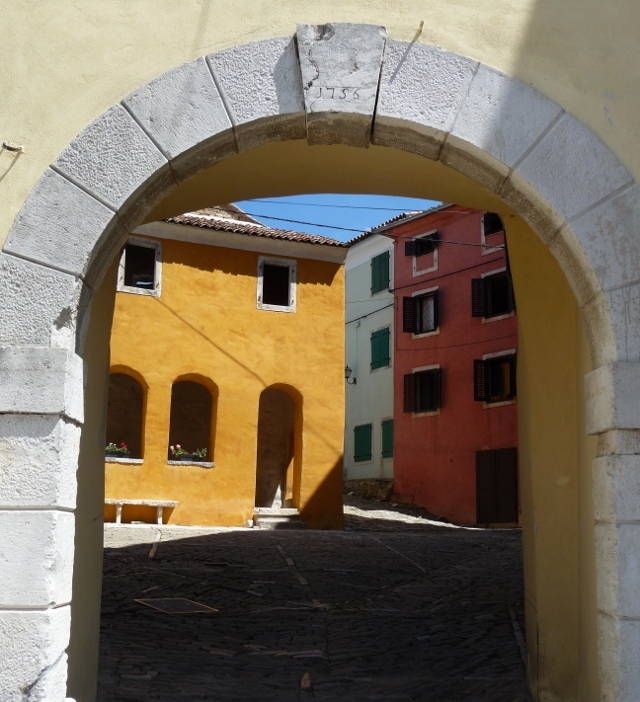 Rovinj was next on the itinerary – together with Pula, it’s both one of Istria’s main cities and main tourist destinations. As with several other of Croatia’s coastal cities, a fortified town grew up on an island, before the channel was filled in to allow the city to grow onto the mainland, as late as the mid 18th century in this case. The old town still stands more-or-less complete, with the ex-channel a little link of squares holding the concrete and tourist tat stalls at bay. Mostly. As with all of these cruise-ship destination towns, the further in to the warren of steep back streets you climbed, the further away you left the cheesiness and crowds. We wound our way slowly up towards the church, with a panoramic view from the top of the bell tower, and the simple yet elegant sixth century stone tomb of St Euphemia sat at the back of one of the aisles. I’m not sure how much there could have been in the coffin, though, since Diocletian (yep, the same one as founded Split) had her soundly tortured in as many ways as he could before finally using her as lion food in the Constantinople amphitheatre. 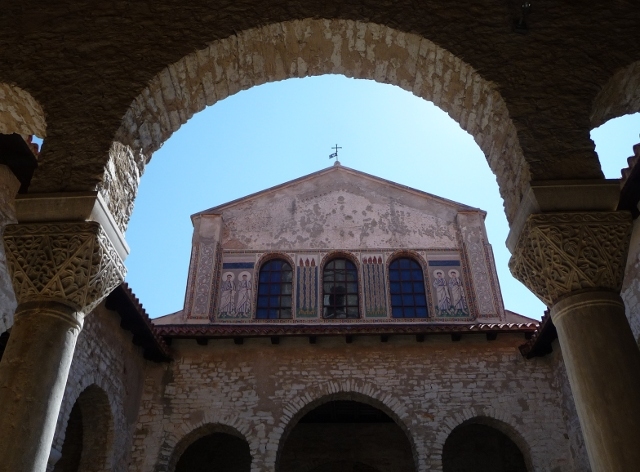 Her remains sat locally until the start of the 9th century, when – still in the coffin – they miraculously did a runner in the face of the rampaging iconoclasts, before arriving on the safe shores of Istria. Quite some achievement for a huge carved stone sarcophogus that looks as if it must weigh several tonnes. After a night at a pleasant but big and resorty campsite on the edge of Rovinj, we headed past Dvigrad, a crumbly castle in the middle of nowhere, before arriving at Poreč. The big draw here is the Basilica of St Euphrasius, a wonderful layer-upon-layer of history going back from the main (and fairly recent) building through to parts of the original 6th century Basilica, via the 10th and 11th century. 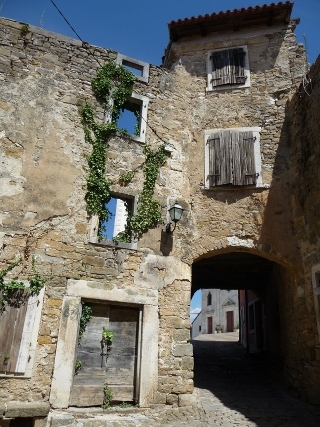 Added to it all is the 17th century Bishop’s Palace – airy and light, with a courtyard garden containing plum trees absolutely dripping with ripe fruit. 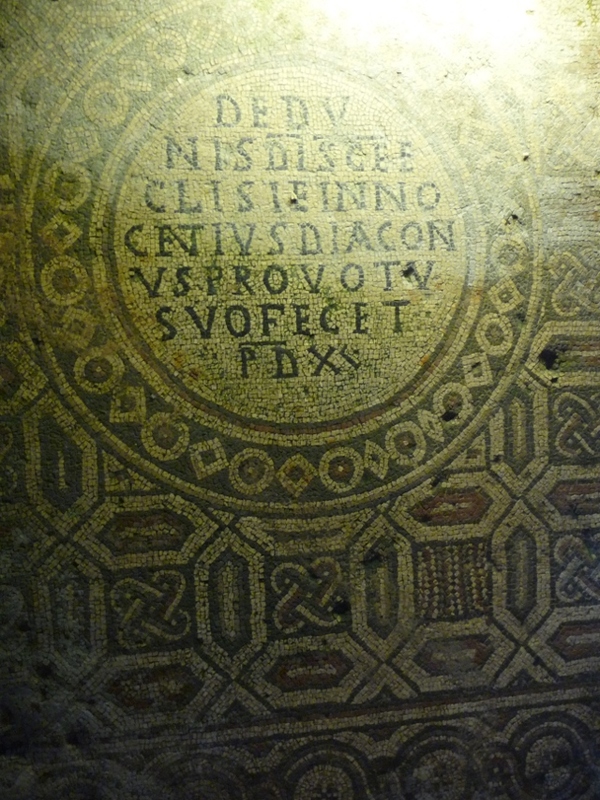 As well as external ruins of the earlier buildings, the current church has various holes in the floor, allowing you to see sections of the original mosaic floor beneath, some of it incredibly well preserved. Onwards again, back into the hills. A small village by the name of Beram is renowned for another church, the 15th century Our Lady on the Rocks. We headed for the village first, and found the key holder, who pointed us off into the woods a kilometre away. We found it, hiding under trees. Despite the assurances that it was open, it was locked up tight. Eventually, a car arrived with a small group in it, one of whom unlocked the church and let everybody else in. The interior was astonishing – almost every square inch covered in frescoes, many still bright despite their age. 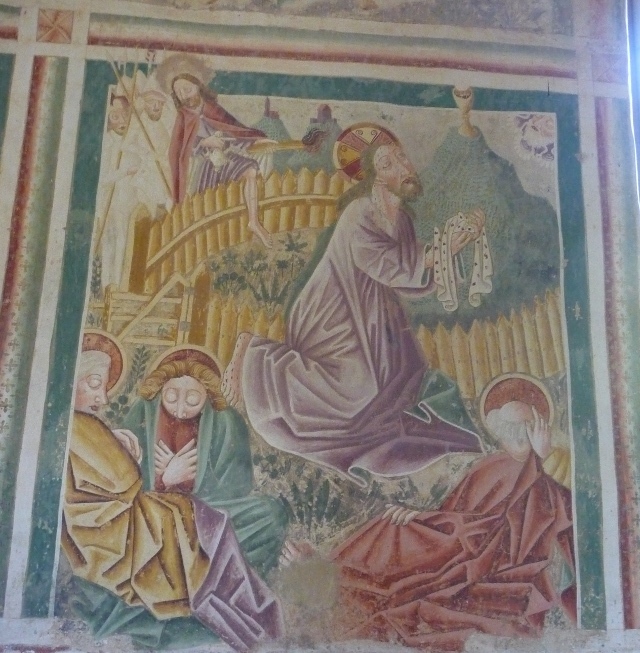 A few changes had been done over the years, unfortunately including adding new windows to the end wall, meaning that the frescoes of Judgement Day (always good for a giggle, since this really was where the medieval priesthood were trying to scare their congregation onto the straight-and-narrow path of the faithful) were incomplete. Hey-ho. 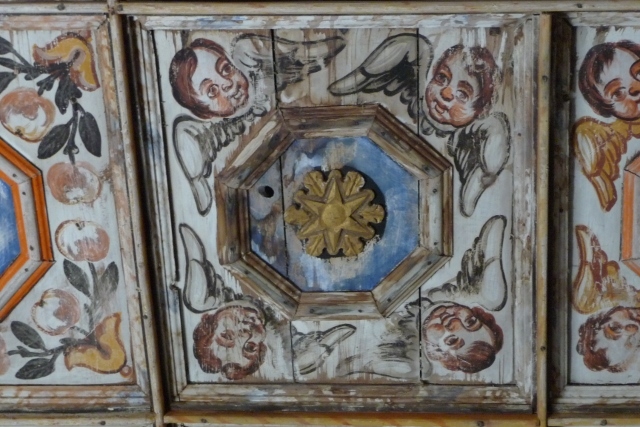 The ceiling had also apparently been paneled over and lowered, but beautifully painted, with no two of the square panels the same. Another hill town, Motovun, was next. By one of those quirks of ever-changing borders, it was the birthplace of the Italian-American 1970s/80s F1 driver Mario Andretti – but the Italian community all left when the area was handed over to the newly Communist Yugoslavia after WW2. Now, it’s another one of the hill towns that’s using the arts as a route to gentrification and to combat depopulation. It definitely seemed to be working for Motovun – we couldn’t actually get beyond the junction at the end of the road, since it was all taped and coned off due to the film festival having just ended the previous day… On we went – only to find the next town, Oprtalj, more than made up for any disappointment at missing Motovun. Although not quite so dramatically sited as Motovun, on a long narrow ridge instead of having the panorama of a rounded hill, Oprtalj immediately made us fall in love with it. We walked up to the main arch into the town, and looked through to a small square backed with a couple of pastel coloured rendered houses. We wandered in, and mooched through tiny circular lanes and passageways. As the midday heat beat down upon us, the shade that they gave was incredibly welcome. We eventually found ourselves wandering back out of that entrance arch, towards the little inn underneath the loggia directly opposite. 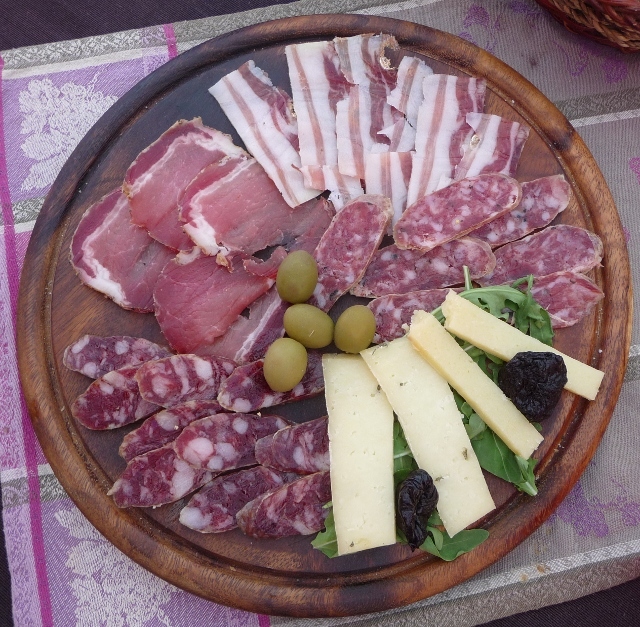 We sat down, and were presented with a huge platter of various local cured meats, sausages and cheese. Delicious. But, before we headed away, the “sweet Raviola” was too intriguing to resist, filled with fig jam and drizzled with delicious fruit sauce. Tempting though it was to just find a tree to sit and snooze beneath, we continued onwards towards Grožnjan. The artistic revival of this particular town came from a slightly different direction – music. It houses an international youth music centre, focussing on a summer-long festival. As we wandered the streets, this was clearly evident – from every open window, notes tumbled from almost every conceivable instrument into the leafy squares and alleyways. That, however, was it. The border with Slovenia was now as imminent as the time we were expected in the suburbs of Ljubljana. We had to go onwards. The border was a mere formality, as was the purchase of a one-week motorway Vignette. Another day, another country.